Berger had the stone analyzed by the Gemological Institute of America, which confirmed its authenticity. He published a blog in Entomology Today about his finding and is looking for entomologists to further analyze it. Plants produce a sticky substance called resin mostly as a means to protect themselves. Under the right circumstances, the chemical structures of these resins can change over time, fossilizing into amber—occasionally trapping and preserving an insect inside. This specimen probably started as a typical insect trapped in amber—but then it appears to have gone through a second process called opalization, where some of the amber turned into opal. Opals are essentially spheres of silicon dioxide with water combined into their chemistry. 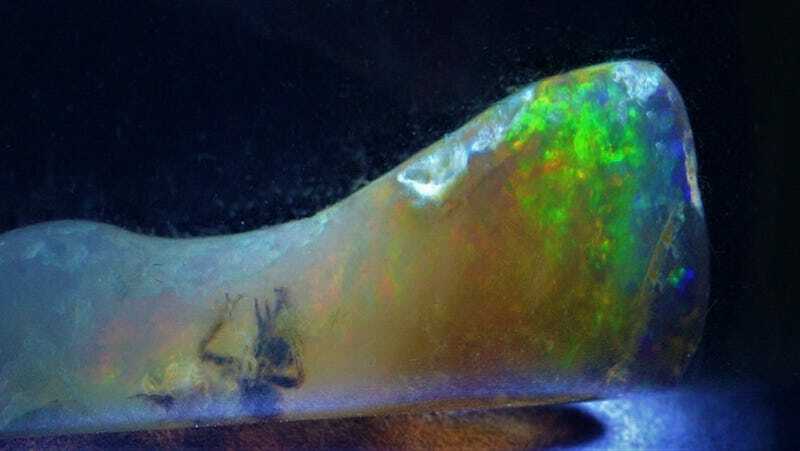 Organic specimens can turn into opal similar to the way fossilization turns bone into stone; paleontologists in Australia have recently found an opalized dinosaur fossil. At least, this is what Berger speculates happened. How the specimen formed remains unclear. One entomologist, Ryan McKellar, curator of invertebrate palaeontology at the Royal Saskatchewan Museum in Canada, told Gizmodo “it is a pretty neat find, and a bit puzzling.” Though commenting only on Berger’s blog post in Entomology Today, McKellar said it “definitely looks like an insect inclusion.” He noted that he’d seen a comparable specimen in Canada, where a piece of wood was partially embedded in resin and partially exposed to the surrounding environment. The amber preserved the wood, but silica replaced the organic matter outside the amber and turned it into petrified wood. McKellar thought that perhaps this specimen was formed by a similar process, and said he’d be interested in the age of the deposit where it was found. Meanwhile, well-known American entomologist George Poinar Jr. from Oregon State University remained cautious. He found the specimen “interesting,” but wanted to wait for an entomologist’s opinion before offering any further comment without examining the object himself. Berger is now hoping to recruit an entomologist to study his stone. He plans to donate the specimen to a museum after the analysis.